Linear Technology Corporation introduces the LTM2894, a USB µModule (micromodule) reinforced isolator that guards against ground-to-ground voltage differentials and large common mode transients. A rugged interface and internal isolation makes the LTM2894 ideal for systems implementing USB in harsh industrial or medical environments where protection from high voltages is required. 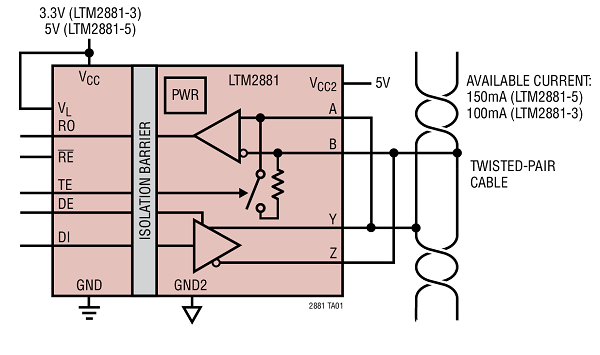 The LTM2894 separates grounds by isolating a pair of USB signal transceivers using internal signal isolation, providing 7500VRMS isolation plus superior common mode transient rejection of greater than 50kV/µs. Able to withstand up to 1000VRMS continuously, the LTM2894 also provides 17.4mm of creepage, a separation distance that allows medical equipment, per IEC 60601-1, to operate from mains voltages greater than 250VRMS while satisfying two means of patient protection. 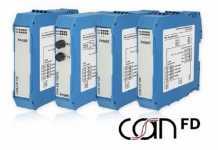 The LTM2894 is ideal for use in a wide variety of USB hub, host and bus isolation applications. The ±20kV ESD-protected transceivers operate at USB 2.0 full speed (12Mbps) and low speed (1.5Mbps), while a suspend mode monitors for inactivity and reduces VBUS current to less than 2.0mA. 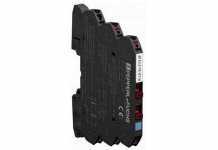 Integrated downstream facing pull-down resistors and upstream facing pull-up resistors are automatically configured to match the speed of the downstream device, enabling the LTM2894 to monitor and report bus speeds to the host. 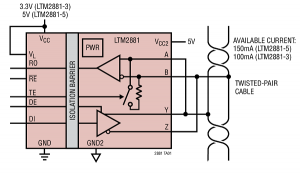 The LTM2894 requires no external components and is a complete µModule solution for isolated USB communications. The LTM2894 is available in a compact 22mm x 6.25mm surface mount BGA package; all integrated circuits and passive components are housed in this RoHS-compliant µModule package. The LTM2894 is available in commercial, industrial and automotive versions, supporting operating temperature ranges from 0°C to 70°C, –40°C to 85°C and –40°C to 125°C, respectively. Pricing starts at $12.20 each in 1,000 piece quantities. The LTM2894 joins a family of µModule isolators that include isolated RS485, RS232, SPI, I²C, CAN and GPIO. Please visit www.linear.com/product/LTM2894 for product selection and information.